These are the nametags for the pilots for VF-101. These are the nametags for the RIOs for VF-101. 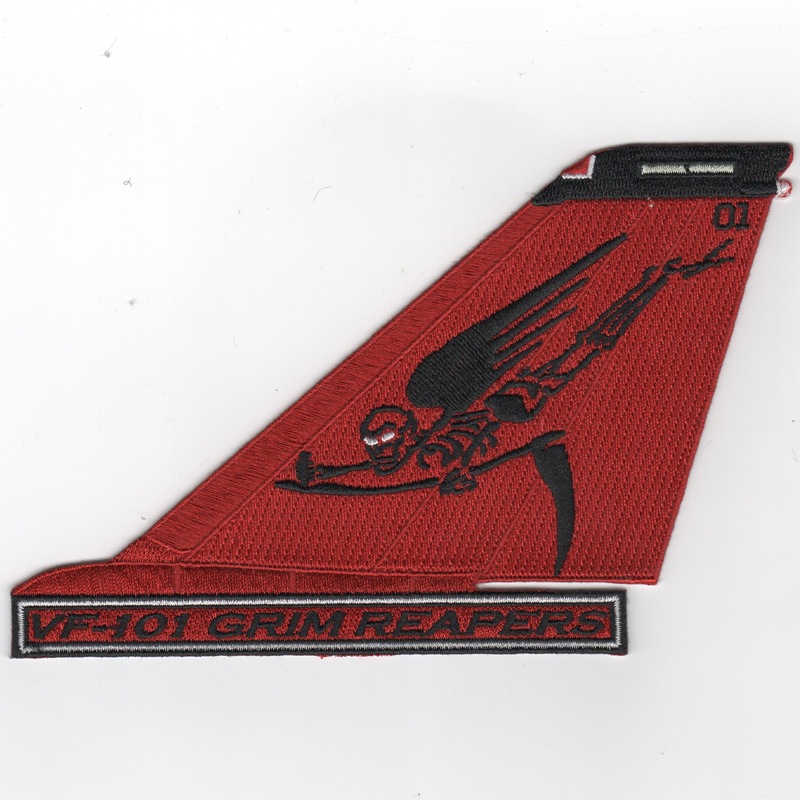 The VF-101 'Grim Reapers' are the training squadron for the F-14 Tomcat and are located at NAS Oceana, VA. They were established in May 1952 and began transitioning to the F-14 Tomcat in 1976, but also flew F-4s until 1977. They fly the F-14A and F-14B models. This is their 60th Anniversary patch. 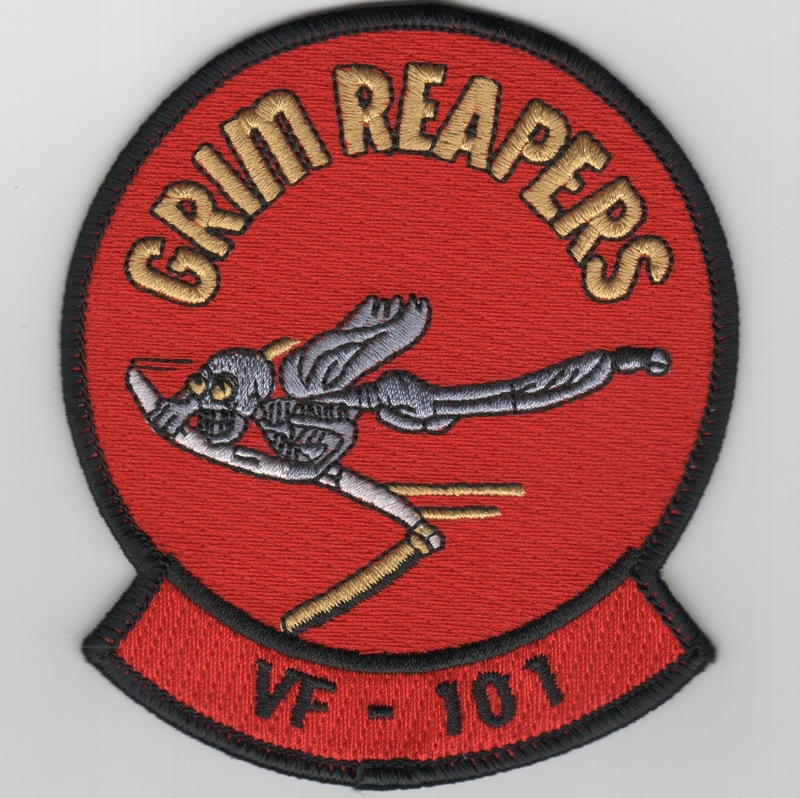 The VF-101 'Grim Reapers' are the training squadron for the F-14 Tomcat and are located at NAS Oceana, VA. They were established in May 1952 and began transitioning to the F-14 Tomcat in 1976, but also flew F-4s until 1977. They fly the F-14A and F-14B models. This is their 'Moe Em Down'/aircraft history patch. 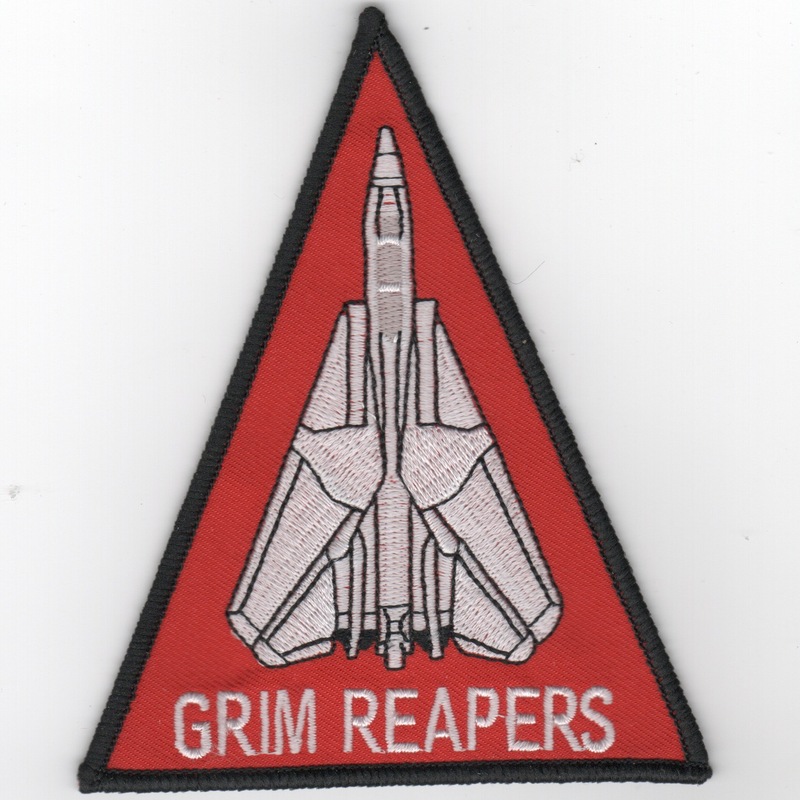 The VF-101 'Grim Reapers' are the training squadron for the F-14 Tomcat and are located at NAS Oceana, VA. They were established in May 1952 and began transitioning to the F-14 Tomcat in 1976, but also flew F-4s until 1977. They fly the F-14A and F-14B models. 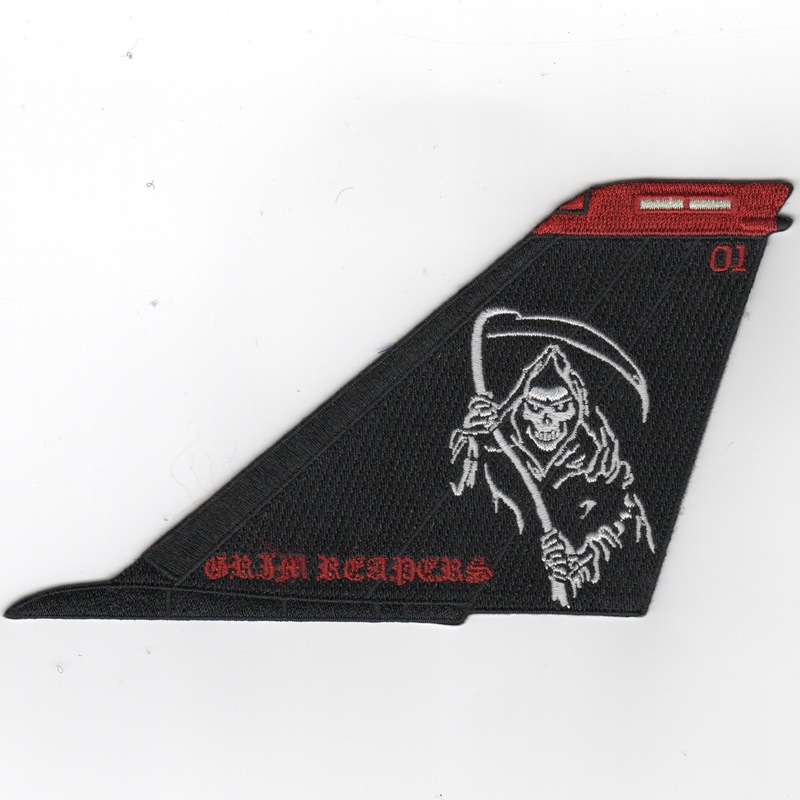 This is the "smaller" version of the famous "Felix" Patch for the Grim Reapers of VF-101 who were the East Coast training squadron for the F-14 Tomcat, and were located on the East coast at the Master Jet Base, NAS Oceana, VA. They were established in May 1952, flying the F-4 Phantoms until transitioning to the Tomcat in 1975. They currently train the F-35C Fleet! This patch does not have velcro attached. This is the "medium-sized" version of the famous "Felix" Patch for the Grim Reapers of VF-101 who were the East Coast training squadron for the F-14 Tomcat, and were located on the East coast at the Master Jet Base, NAS Oceana, VA. They were established in May 1952, flying the F-4 Phantoms until transitioning to the Tomcat in 1975. They currently train the F-35C Fleet! This patch does not have velcro attached. Callsign "GUNFIGHTER", the Grim Reapers of VF-101 are the only training squadron for the F-14 Tomcat now, and are located on the East coast at the Master Jet Base, NAS Oceana, VA. They were established in May 1952, flying the F-4 Phantoms until transitioning to the Tomcat in 1975. This was their last "felix" patch denoting the F-14D Tomcat model they received for the last few years of training. Callsign "GUNFIGHTER", the Grim Reapers of VF-101 are the only training squadron for the F-14 Tomcat now, and are located on the East coast at the Master Jet Base, NAS Oceana, VA. They travel to NAS Key West with the 'nugget' students in order to train in the Air-to-Air arena in the airspace around Key West, FL. Flying isn't the only fun to be had, though. Callsign "GUNFIGHTER", the Grim Reapers of VF-101 are the only training squadron for the F-14 Tomcat now, and are located on the East coast at the Master Jet Base, NAS Oceana, VA. Callsign "Gladiators", VFA-106 is the East Coast training squadron for the F/A-18 Hornet, and are also located at NAS Oceana, VA. Together, they traveled to NAS Key West with the 'nugget' students in order to train in the Air-to-Air arena in the airspace around Key West, FL. This is the first joint fighter det between the two. Callsign "GUNFIGHTER", the Grim Reapers of VF-101 were the only training squadron for the F-14 Tomcat now, and were located on the East coast at the Master Jet Base, NAS Oceana, VA. This was created for the "reservist" pilots that flew originally with VF-201 and VF-202 out of NAS Dallas, TX. Callsign "GUNFIGHTER", the Grim Reapers of VF-101 were the only training squadron for the F-14 Tomcat now, and were located on the East coast at the Master Jet Base, NAS Oceana, VA. This felix patch was created for the VF-101 "theme" during the decommissioning ceremony and the celebration that took place in honor of the squadron. This is the reason the Tomcat students trained so diligently...says it all after what happened on 9-11-01....Payback, Baby!! Callsign "GUNFIGHTER", the Grim Reapers of VF-101 are the only training squadron for the F-14 Tomcat now, and are located on the East coast at the Master Jet Base, NAS Oceana, VA. This is the Tomcat aircraft patch worn on the right flight suit sleeve. This is the Red/White/Blue version of the "TOMCAT" aircraft triangle patch worn by the F-14 Tomcat aircrew from VF-101. This is the red, white, & blue version of the aircraft triangle patch worn by the F-14 Tomcat aircrew from VF-101 that fly the airshow demonstrations. They have to be Tomcat Instructors (pilots and RIOs) in order to qualify for the chance to do this. This is the "black-text" version of the Tomcat Felix patch worn by the F-14 Tomcat aircrew from VF-101 that fly the airshow demonstrations. They have to be Tomcat Instructors (pilots and RIOs) in order to qualify for the chance to do this. These are becoming a rarity with the Tomcat squadrons decommissioning. This is the "red-text" version of the Tomcat Felix patch worn by the F-14 Tomcat aircrew from VF-101 that fly the airshow demonstrations. They have to be Tomcat Instructors (pilots and RIOs) in order to qualify for the chance to do this. These are becoming a rarity with the Tomcat squadrons decommissioning. The Grim Reapers of VF-101 were the only training squadron for the F-14 Tomcat now, and were located on the East coast at the Master Jet Base, NAS Oceana, VA. 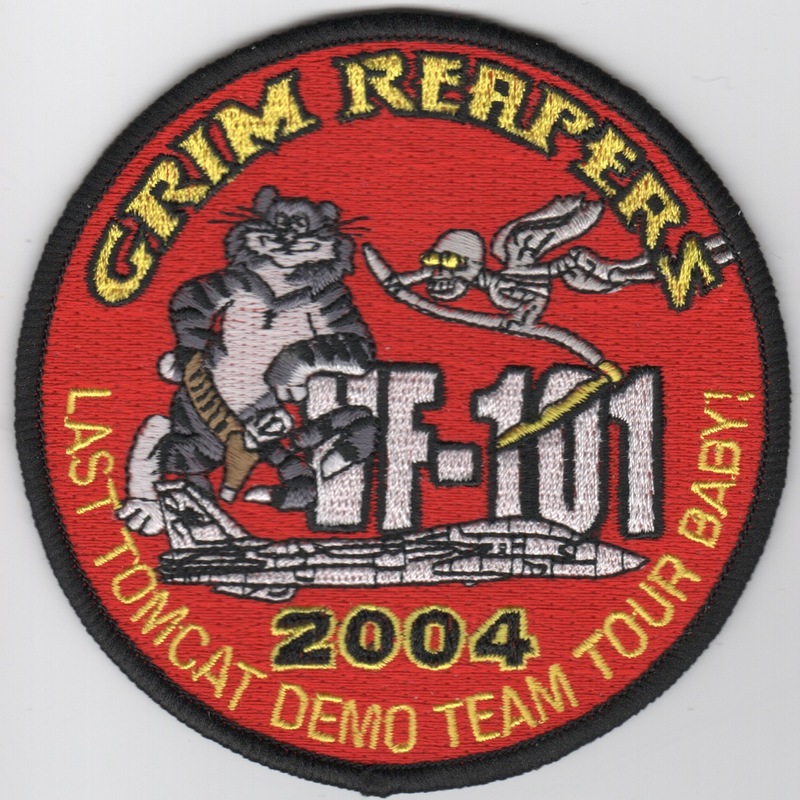 This is the 2004 version of the "Last Demo Tour" patch they created. Since they were the training squadron, the Tomcat Pilots and RIOs from this squadron were the "experts" and the ones allowed to do the Airshow Demonstrations. This patch does not come with velcro attached. The Grim Reapers of VF-101 were the only training squadron for the F-14 Tomcat now, and were located on the East coast at the Master Jet Base, NAS Oceana, VA. 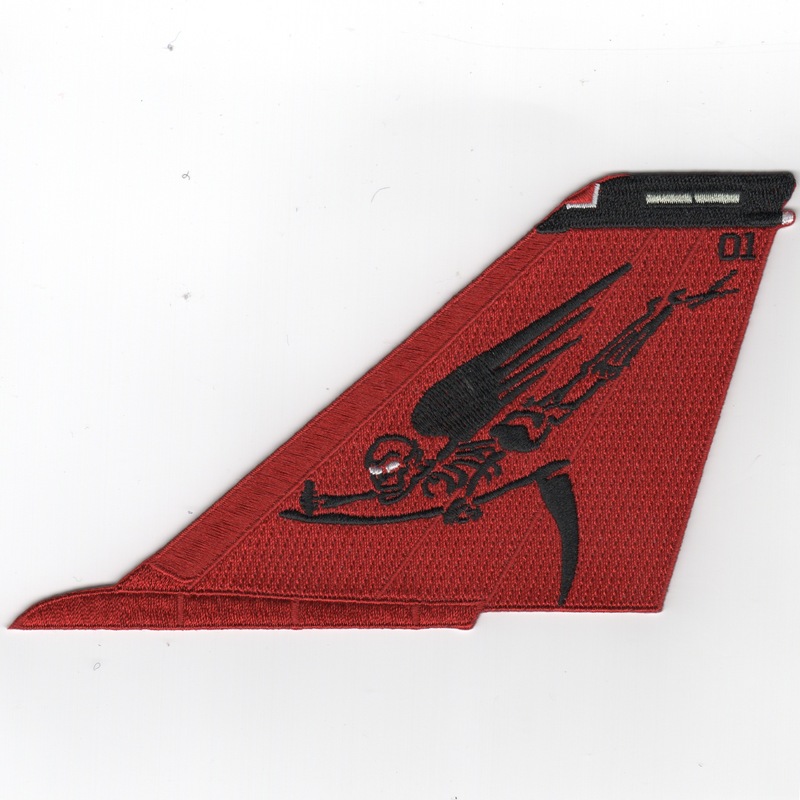 This is one of the "farewell" patches created by the squadron for their historic transition from F-14 Tomcats to the F-35. This is from the original supplier, so they are as authentic as I can get!! This patch does not come with velcro attached. Callsign "GUNFIGHTER", the Grim Reapers of VF-101 are the only training squadron for the F-14 Tomcat now, and are located on the East coast at the Master Jet Base, NAS Oceana, VA. This is the class patch for the graduating class of Tomcat Pilots and RIOs that started in January 1998. Callsign "GUNFIGHTER", the Grim Reapers of VF-101 are the only training squadron for the F-14 Tomcat now, and are located on the East coast at the Master Jet Base, NAS Oceana, VA. This is the class patch for the graduating class of Tomcat Pilots and RIOs that started in February 1998. Callsign "GUNFIGHTER", the Grim Reapers of VF-101 are the only training squadron for the F-14 Tomcat now, and are located on the East coast at the Master Jet Base, NAS Oceana, VA. This is the class patch for the graduating class of Tomcat Pilots and RIOs that started in April 1998. Callsign "GUNFIGHTER", the Grim Reapers of VF-101 are the only training squadron for the F-14 Tomcat now, and are located on the East coast at the Master Jet Base, NAS Oceana, VA. This is the class patch for the graduating class of Tomcat Pilots and RIOs that started in May 1998. Callsign "GUNFIGHTER", the Grim Reapers of VF-101 are the only training squadron for the F-14 Tomcat now, and are located on the East coast at the Master Jet Base, NAS Oceana, VA. This is the class patch for the graduating class of Tomcat Pilots and RIOs that started in January 1999. Callsign "GUNFIGHTER", the Grim Reapers of VF-101 are the only training squadron for the F-14 Tomcat now, and are located on the East coast at the Master Jet Base, NAS Oceana, VA. This is the class patch for the graduating class of Tomcat Pilots and RIOs that started in March 1999. Callsign "GUNFIGHTER", the Grim Reapers of VF-101 are the only training squadron for the F-14 Tomcat now, and are located on the East coast at the Master Jet Base, NAS Oceana, VA. This is the class patch for the graduating class of Tomcat Pilots and RIOs that started in April 1999. Callsign "GUNFIGHTER", the Grim Reapers of VF-101 are the only training squadron for the F-14 Tomcat now, and are located on the East coast at the Master Jet Base, NAS Oceana, VA. 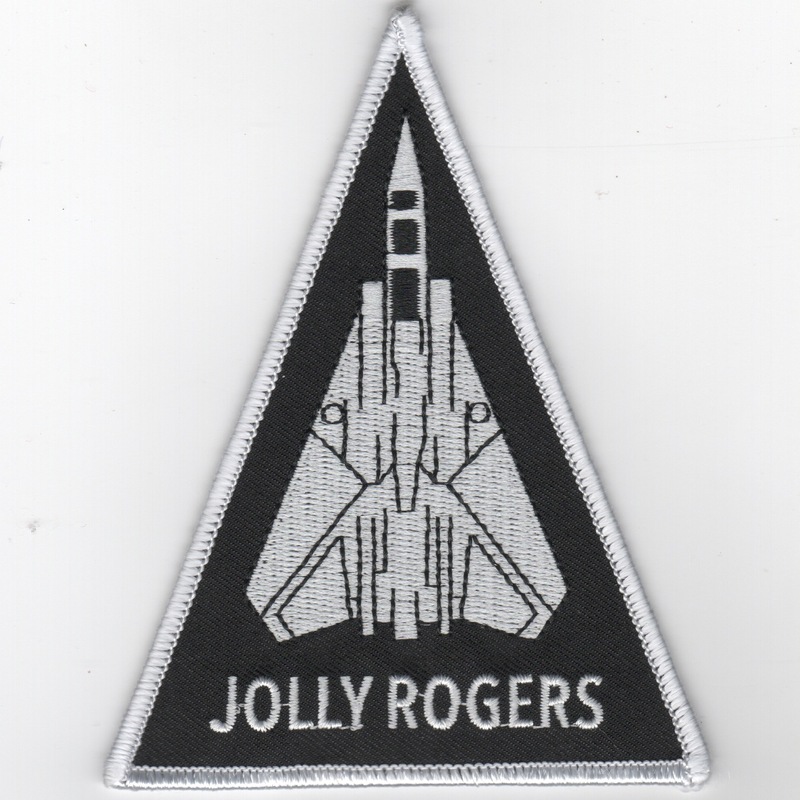 This is the class patch for the graduating class of Tomcat Pilots and RIOs that started in May 1999. Callsign "GUNFIGHTER", the Grim Reapers of VF-101 are the only training squadron for the F-14 Tomcat now, and are located on the East coast at the Master Jet Base, NAS Oceana, VA. This is the class patch for the graduating class of Tomcat Pilots and RIOs that started in February 2000. Callsign "GUNFIGHTER", the Grim Reapers of VF-101 are the only training squadron for the F-14 Tomcat now, and are located on the East coast at the Master Jet Base, NAS Oceana, VA. This is the class patch for the graduating class of Tomcat Pilots and RIOs that started in March 2001. Callsign "GUNFIGHTER", the Grim Reapers of VF-101 are the only training squadron for the F-14 Tomcat now, and are located on the East coast at the Master Jet Base, NAS Oceana, VA. This is the class patch for the graduating class of Tomcat Pilots and RIOs that started in April 2001. Callsign "GUNFIGHTER", the Grim Reapers of VF-101 are the only training squadron for the F-14 Tomcat now, and are located on the East coast at the Master Jet Base, NAS Oceana, VA. This is the class patch for the graduating class of Tomcat Pilots and RIOs that started in January 2002 and it says "Let's Roll" at the bottom. Callsign "GUNFIGHTER", the Grim Reapers of VF-101 are the only training squadron for the F-14 Tomcat now, and are located on the East coast at the Master Jet Base, NAS Oceana, VA. This is the class patch for the graduating class of Tomcat Pilots and RIOs that started in March 2002 and it says "TRUE" at the bottom. Callsign "GUNFIGHTER", the Grim Reapers of VF-101 are the only training squadron for the F-14 Tomcat now, and are located on the East coast at the Master Jet Base, NAS Oceana, VA. This is the class patch for the graduating class of Tomcat Pilots and RIOs that started in April 2002 and it says "SOME LIKE IT FAST" at the bottom. Callsign "GUNFIGHTER", the Grim Reapers of VF-101 are the only training squadron for the F-14 Tomcat now, and are located on the East coast at the Master Jet Base, NAS Oceana, VA. This is the class patch for the graduating class of Tomcat Pilots and RIOs that started in January 2003 and it says "Can you Hear Me Now" along the side. Callsign "GUNFIGHTER", the Grim Reapers of VF-101 are the only training squadron for the F-14 Tomcat now, and are located on the East coast at the Master Jet Base, NAS Oceana, VA. This is the class patch for the graduating class of Tomcat Pilots and RIOs that started in February 2003 and it says "ABSOLUT FIGHTER since 1972" along the bottom. Callsign "GUNFIGHTER", the Grim Reapers of VF-101 are the only training squadron for the F-14 Tomcat now, and are located on the East coast at the Master Jet Base, NAS Oceana, VA. This is the class patch for the graduating class of Tomcat Pilots and RIOs that started in March 2003 and it says "Shock & Awe" along the bottom. Callsign "GUNFIGHTER", the Grim Reapers of VF-101 are the only training squadron for the F-14 Tomcat now, and are located on the East coast at the Master Jet Base, NAS Oceana, VA. This is the class patch for the graduating class of Tomcat Pilots and RIOs that started in April 2003 and it says "Totally Nuts" along the bottom with "Mr. Planters" as their mascot. Callsign "GUNFIGHTER", the Grim Reapers of VF-101 are the only training squadron for the F-14 Tomcat now, and are located on the East coast at the Master Jet Base, NAS Oceana, VA. This is the "official" class patch for the graduating class of Tomcat Pilots and RIOs that started in January 2004 and it says "SANS BIG STICK" along the bottom with a picture of "Felix" leaning on an AIM-54 missile. Callsign "GUNFIGHTER", the Grim Reapers of VF-101 are the only training squadron for the F-14 Tomcat now, and are located on the East coast at the Master Jet Base, NAS Oceana, VA. This is the "unofficial" class patch for the graduating class of Tomcat Pilots and RIOs that started in January 2004 and it says "Pushin' The Envelope" along the bottom with a picture of a female. Callsign "GUNFIGHTER", the Grim Reapers of VF-101 are the only training squadron for the F-14 Tomcat now, and are located on the East coast at the Master Jet Base, NAS Oceana, VA. This is the class patch for the graduating class of Tomcat Pilots and RIOs that started in February 2004 and it says "Truckmasters" along the bottom with a picture of an 18-wheeler. Callsign "GUNFIGHTER", the Grim Reapers of VF-101 were the only training squadron for the F-14 Tomcat now, and are located on the East coast at the Master Jet Base, NAS Oceana, VA. 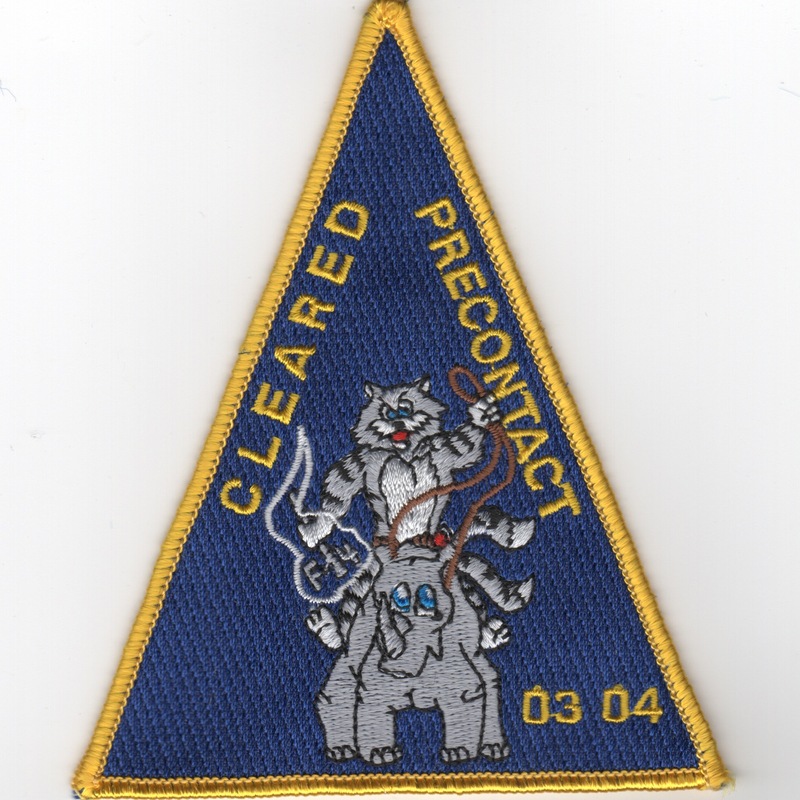 This is the class patch for the graduating class of Tomcat Pilots and RIOs that started in March 2004 and it says "CLEARED PRECONTACT" along the sides with the Tomcat riding a Rhino. Callsign "GUNFIGHTER", the Grim Reapers of VF-101 were the only training squadron for the F-14 Tomcat now, and were located on the East coast at the Master Jet Base, NAS Oceana, VA. 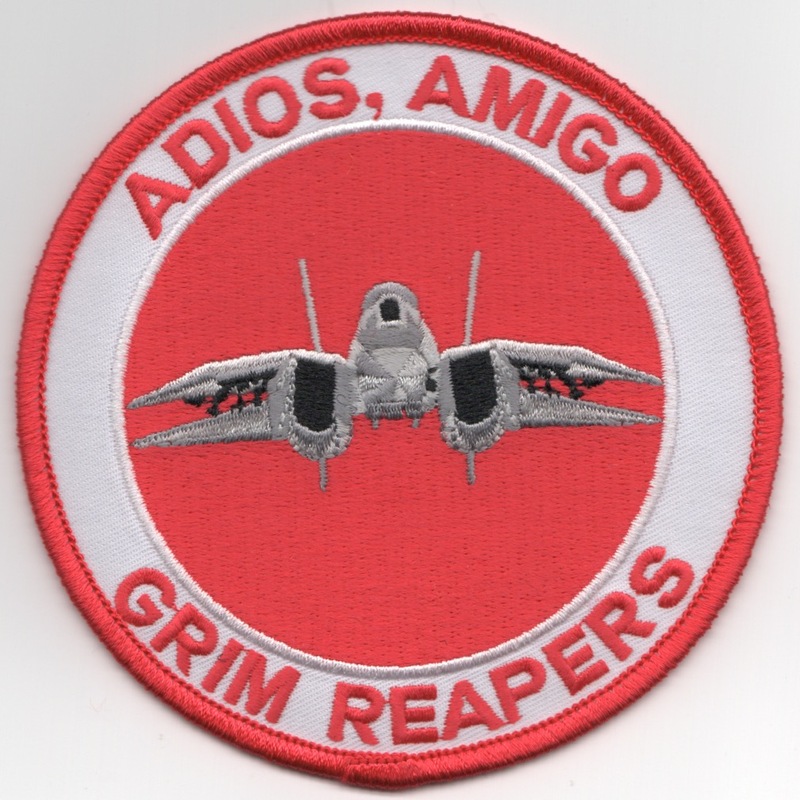 This is the decommission patch for all the Tomcat Pilots and RIOs. The Grim Reapers of VF-101 were the only training squadron for the F-14 Tomcat now, and were located on the East coast at the Master Jet Base, NAS Oceana, VA. 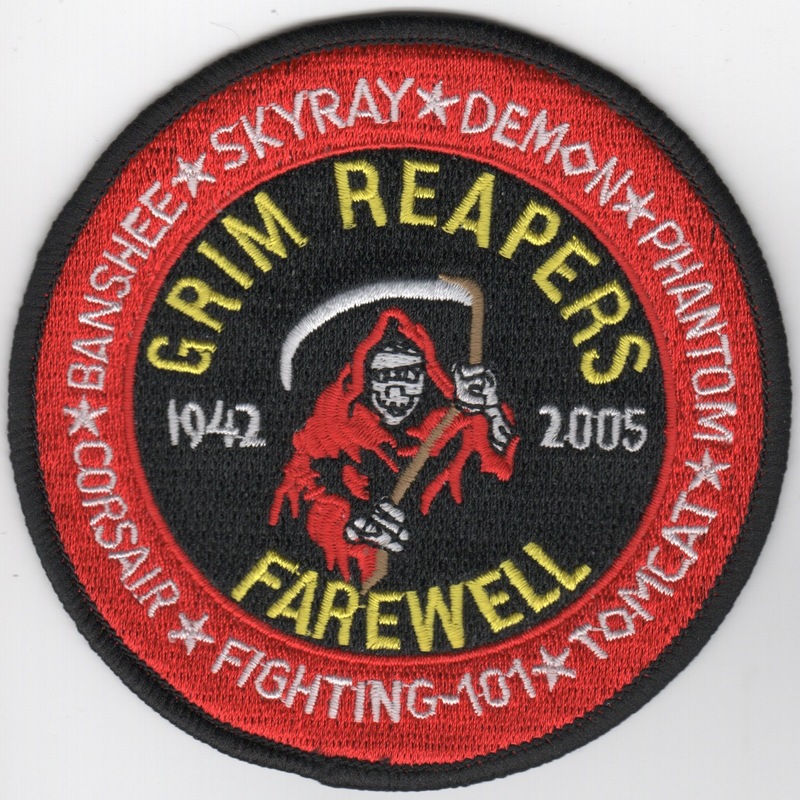 This is the "FAREWELL" patch for all the Tomcat Pilots and RIOs. It shows all the aircraft they flew, and the years 1942-2005. This patch does not come with velcro attached. Callsign "GUNFIGHTER", the Grim Reapers of VF-101 were the only training squadron for the F-14 Tomcat now, and were located on the East coast at the Master Jet Base, NAS Oceana, VA. 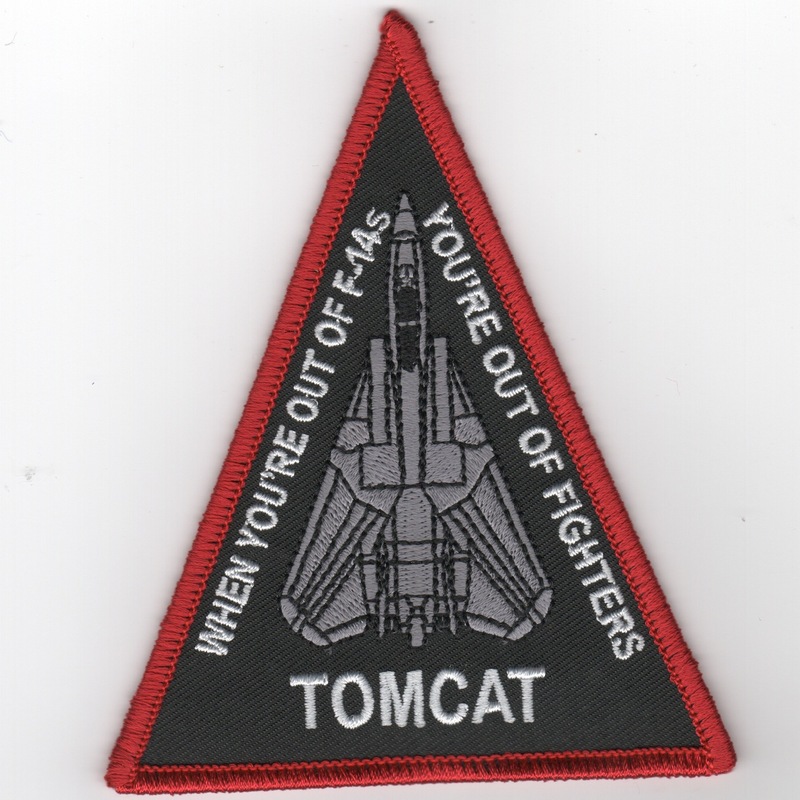 This patch was created for the Tomcat decommissioning and states "When You're Out of F-14s, You're Out of Fighters". This is the red-bordered version. 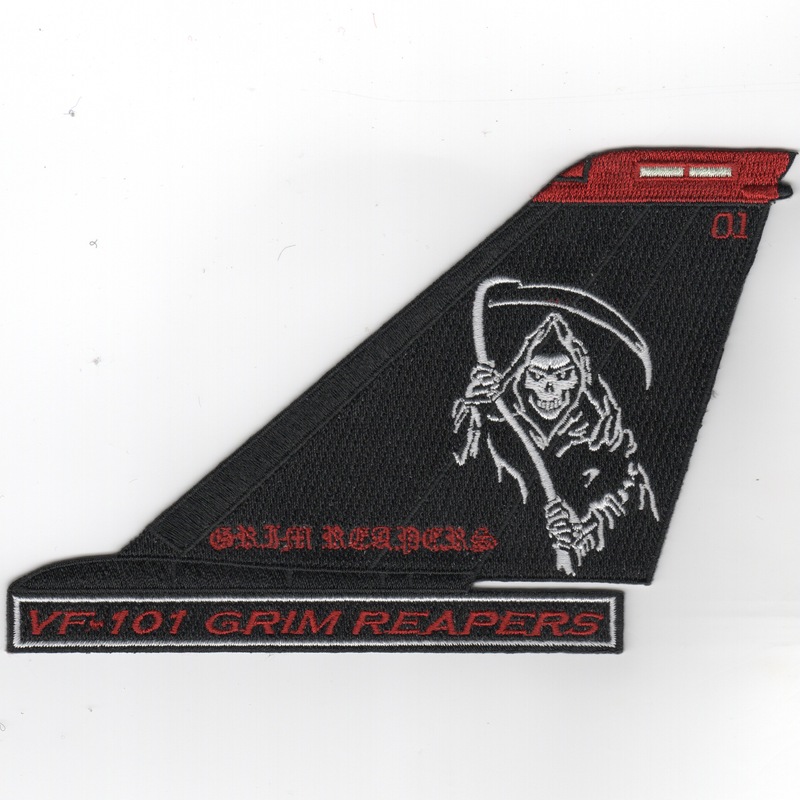 Homepage | Order VF-101 Patches!